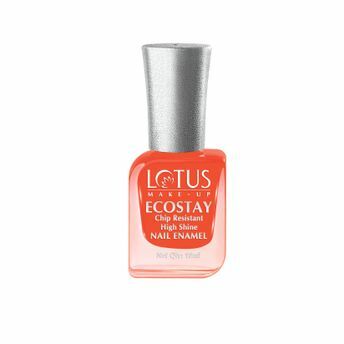 Paint your nails with the alluring strokes of Orange Glare with this 100% vegetarian ECOSTAY NAIL Enamel ORANGE GLARE, which is free from DBP, Toluene & Formaldehyde. This innovative nail enamel is 7 days chip resistant and gives you a perfect finish with a glossy, mesmerizing texture. It consist of 24 luxurious colors your nails will be obsessed with. This enamel is long-lasting and highly pigmented. This trendy nail enamel comes with a flat brush for smooth & perfect application and gives you a salon finish. Explore the entire range of Nail Polish available on Nykaa. Shop more Lotus Herbals products here.You can browse through the complete world of Lotus Herbals Nail Polish .